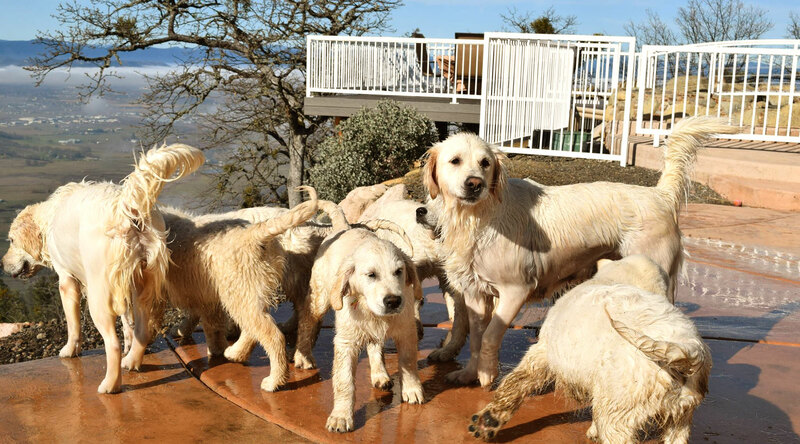 The Hill Haven English Cream Golden Retrievers carry one of the most unique distinctions. We focus hard on creating a unique training program that helps puppies to understand basic and advanced training techniques. Families that are too busy to train a puppy need to consider the puppy training courses to learn how to command their dog. The different training programs we provide have taken years to create and perfect. One of the major areas we focus on is teaching the Golden Retriever puppies the importance of socialization and healthy behavior. We focus on training that provides you with a mentally stable puppy for life. No matter what you would like your puppy to do, we will train them to become the best friend you have ever had. Our training program is broken down into three areas. We start with the puppy training program that usually starts at 4 weeks of age. Each puppy will go through house training program. This will involve crate training, and proper break times to allow the puppy to avoid peeing in the home. They will also learn how to sleep through the night by using crate training. Chew training is another important step as puppies need to understand what they can and cannot chew. They will understand why they need to avoid biting others and to avoid being aggressive. The secondary training phase will help the puppy to learn how to respond to voice and hand commands. The puppies will understand how to go up and down stairs without getting hurt. Each puppy is worked with to make sure they are adequately trained and ready for their owners. Every English Cream Golden Retriever needs to learn how to be social. Puppies will go out with us on trips to different locations to meet with different people and other dogs. Our puppies are given guest homes for people to visit and select their ideal puppy. Each puppy is given the right training to be social with all types of people and dogs. The other thing we do is focus on training the puppies to be around children. This will help to keep your children safer around the dog. The other thing we do to help our puppies is to take them around a feisty cat. This is a great way to help the dogs get used to other animals and will help them avoid hurting them. A puppy needs to be trained to learn how to walk with a leash. Our trainers will help to teach a puppy how to walk next to you, and become used to walking with a leash. A puppy needs to go outside for running needs as well as they must be able to learn how to ride inside a car without getting hurt or ending up with motion sickness. It is important to remember that every puppy has their own unique personality. We work hard to help our puppies avoid common phobias and problems, but that can easily change with the owners. An owner who does not focus on adequate training can allow a dog to overrun them and their home. It is important to assert your dominance to the dog so they know you are the leader. Our trained English Golden Retrievers will make the perfect addition to your family. For additional information about our dog and puppy training courses, call Hill Haven Kennel today!